The alternative housing movement has been raging on in full force for the better part of the past decade or so. 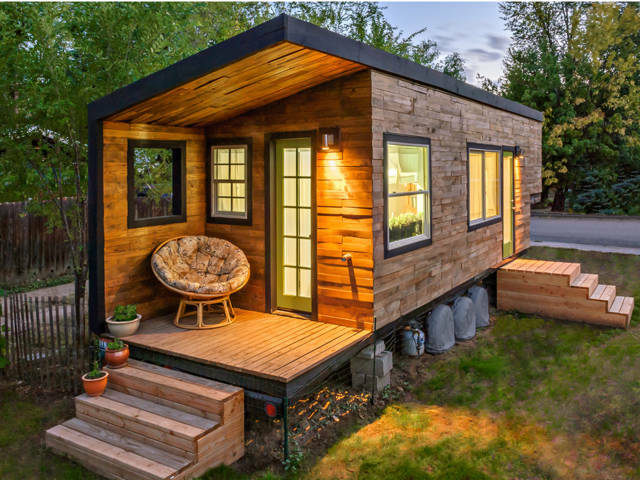 Pioneering this new way of life has been the ‘tiny house’ movement. Tiny houses are exactly what their title implies: homes that are incredibly small and maximized to make life convenient and accessible. Today we are going to talk about an offshoot of the Tiny House movement — the skoolie. Skoolies are vehicles, typically school buses, that have been turned into homes on wheels. Today we are going to follow the story of a young couple from Florida who decided to change out their 1,6000 square foot home for a bus that they called, ‘Just Right’. Follow along each step of the way as Chris and Kelly created their dream: a home on wheels. 40. It started with a dream. Chris and Kelly were a pair of high school sweethearts that transitioned into adult life together. They spent the majority of their 20s bouncing around from apartment to apartment before finally landing in a giant home: 1,600 square feet with 3 bedrooms and a pair of bathrooms. Despite this gorgeous home, the couple wasn’t happy. Enter stage left: the tiny house movement and the skoolie evolution. 39. Was tiny right for them? Naturally, the pair started to research the tiny house movement that had been all over television and the internet. While the idea of a small, maximized home appealed to them — it still wasn’t quite right. Chris and Kelly wanted something mobile that could haul around the whole family. 38. Time for the skoolie! What could be more mobile and roomy than a school bus? Well, probably a lot of things. Still, the creative couple decided that a school bus could solve their mobile home needs. If classic cars are cool then classic buses are super cool. Chris and Kelly opted to go for the 1991 Ford Thomas school bus. This bus has 11 rows of seats that can fit up to 64 passengers at a time. Would that be roomy enough for the couple and their dogs? 36. A big step toward a perfect fit. While many friends and family members were telling Chris and Kelly to give up on this idea, the high school sweethearts were doubling down. Here we see the pair taking their bus home for the first time. As it turns out the ’91 Ford Thomas was in excellent condition. Apparently Lynchburg, VA is a dry county which reduced rust issues to almost nil. The engine only had 127,000 miles clocked on it as well — the bus was apparently a ‘spare’. A great foundation can solve a lot of potential problems! 34. Chris and Kelly survey the engine. Before work begins Chris and Kelly stare down at the engine of the vehicle they had just purchased. They found out that the bus didn’t have a dedicated route for the past five years, thus preserving the bus’s innards. Still, this was going to be a big job. All of the smiles and butterflies give way to the sheer volume of the task ahead of them. Here we see that the bus has already been stripped of all 11 rows of seats. We can basically smell the rubber from here. They didn’t know it yet but a nasty surprise was waiting. 32. The layers are all wrong. The first job for the bus was going to be to strip the floor down. Most school bus transformations involve a simple three layer floor system: a metal base with a plywood middle and rubber topping it all off. Chris quickly found out that the rubber was glued directly to the metal — no plywood. There’s no substitution for hard work so Chris and Kelly park the bus under some trees and continue working on the floor. They have to peel up the rubber, remove siding, and even address all of the old insulation in the vehicle. While the floor is backbreaking work it is still relatively simple. Addressing the roof, however, is a whole different ballgame. Here Chris begins unscrewing the sheets that comprise their roof. It is important to get in there to see the state of the electrical system. 29. Five days of work commence. With over 1,400 screws to remove it takes Chris and Kelly’s dad almost a full week to get the job done. They use an impact drill and an impact driver in order to get the majority of these screws removed. With a stiff neck and a sore arm, Chris manages to finish removing all of the roof panels. This is a huge moment in the transformation project. 27. Sand, Clean, Scrub — Repeat. It doesn’t take a wild imagination to realize that a couple of decades of school kids could make the bus a little bit nasty. So Chris and Kelly load up on some elbow grease and get to work. Taking a break from the monotony of work, Chris and Kelly celebrate the acquisition of their license plate and title with a quick drive around town. Chris seems instantly comfortable behind the wheel. With the thrill of the ride out of their system, Chris and Kelly turn back to work. Next, up the team has to coat the interior of the bus with this rust-protective paint. This was the final step before moving on to the next big phase: construction. 24. Bring in the plywood! Chris and Kelly decide to break the ‘no plywood’ cycle by installing their own base layer. This creates an easy surface to work with that is flexible and sturdy. 23. The next phase begins. It took almost a month for Chris and the gang to break the bus down to its bare bones. Now we get to watch them build the machine back up as their perfect home on wheels. Who is excited? 22. The plans begin to take shape. Kelly whips together a 3D floor plan to showcase what their goal is with the Just Right bus. If everything works out we could be looking at quite the beautiful home! Converting this bus turned into quite the Herculean task for the young couple and naps were stolen when possible! During this construction phase, Chris was attending Medical School while Kelly worked full time. 20. No help at all. Despite a ton of work to do both Connie and Willow, the two family dogs, are committed to not helping. Oh well. 19. Back to the kitchen. If the kitchen is the heart of a home then that’s where Chris and Kelly should start. Here we see they opted for an alcohol based stove in order to conserve energy and stay away from gas or electric. With the stove coming along, Kelly needs to decide how high she wants the countertops to be. The couple settles on 36″ in height. At the back of the bus, Chris focuses on setting up the bedroom. Here we see that the bed has been framed out with a queen mattress and he even has put up insulation. 16. Bring on the closets. Kelly designed the bus with as many closets as possible. Having enough storage space is integral to living your life on the road. 15. Chris begins on the bathtub. With most skoolies, you will be lucky to score a comfortable standing shower. Chris and Kelly decided to dream big and gun for their own bath tub. Just wait until you see this thing finished! 14. Here comes the Title. Laying down the tiling is aggravating work due to the cramped conditions. Still, we have to say that it came out pretty nice! This had to be done after the ceiling was painted — for obvious reasons. 13. The weather gets the team down. Hauling the bus from Virginia to home in Florida meant that they were re-engaging with the weather. Storms were a near constant and it dragged morale down. Fortunately, the bus proved its worth by showing that it was weather proof. With the insulation installed and the bus completely weather proof, it is time to bring on some power. The couple decides to hire a professional electrician to put the power in. This is the safe choice if you don’t have enough experience to do the job yourself. 11. Kitchen progression is smooth. Before you know it we are seeing tangible progress in the kitchen. Cabinets are sprouting out of the floor and appliances are on their way! 10. Gorgeous countertops are installed. Here we see some counter tops from Ikea put in place. They add a whole new element to the growing kitchen. 9. The sink is installed. Loving to cook, the couple opts to install a sizable sink into their kitchen. 8. Now comes the flooring. The finish line is now in sight and flooring work has begun! This wood flooring is comfortable and visually pleasing — important aspects for a house on wheels. The end is in sight, what could go wrong? 7. Everything goes wrong for Chris. Chris is sent to the Emergency Room after a saw slips and cuts his hand open. 10 hours in the ER, 14 stitches, and a couple of months of physical therapy are required for Chris to work his way back from the injury. Back in action, Chris focuses his work on the exterior of the bus. During his convalescence, much of the interior work has finished off. It’s been almost a year of construction on this project and now they are ready to step into the bus for the first time as a ‘home’. It’s an emotional moment when Chris and Kelly step onto their ‘Just Right’ bus after having it fully decorated. You can see how her plans and their hard work had led to an amazing outcome. Look at how beautiful their kitchen has become? The hanging decor, stainless steel appliances, and wood all work together so well. Didn’t we say that this was going to be gorgeous? The bath tub was non-negotiable and we bet that they are glad they stuck to it. This has got to be the coziest bedroom that we’ve ever seen. 1. Just Right for them. A year of work and a complete life overhaul have made Chris and Kelly closer than ever before. Despite the time, money, and blood invested into the project it is clear that they are one thing: happy.